Now that your tilted quilt blocks and sashing are sewn together, it’s time to start making the borders. 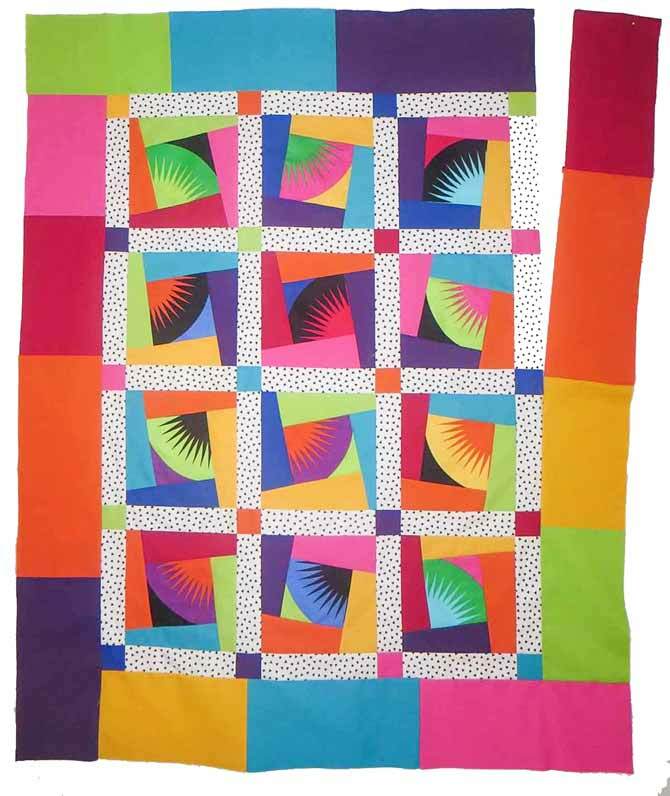 Here’s an easy and clever way to make a more interesting quilt border using the ColorWorks Concepts solid color fabric. From each solid color, cut 1 or 2 – 5½” strips on the lengthwise grain. My strips measure between 10″ and 14″ in length. It makes a more interesting border if the strips are different lengths. Put the completed blocks on a design wall or the floor. Start placing the strips around the outside of the blocks until you have an arrangement you like. You may have to cut a few extra 5½” strips. You need to have 2 side borders that measure about 43″ and top and bottom borders that measure about 34″. Sew the border strips together, end to end, to make the length you need for each side. Press seams open. Sew on the first side border with a partial seam. The bottom of the border should be even with the bottom of the quilt. Press seam toward border. Sew the first side border with a partial seam. Sew on the bottom border next. Press seam toward border. Trim excess fabric. Sew on the next 2 borders, trimming excess fabric as needed. Then complete the seam in the first border. After making the borders, you’ll probably have enough solid color fabrics left to make a pieced backing. Another opportunity to get creative! Press the quilt top carefully and you’re all ready for quilting! I hope you enjoyed making the borders this way, it cuts from the monotony. Come back tomorrow and I’ll give you a sneak peak at the next ColorWorks Concepts collection that will be in quilt shops soon! Love the improv border. I’m definitely going to try this one! Glad you liked it! It’s a very versatile border style and can be made in whatever width you want. Just started quilting, need all the tutoring I can get :)… I love this border! Thanks so much for the tutorial. Great border! I’ve been dipping my toes into the Modern Quilt craze and I think this border will help. Thanks! I’m enjoying the modern quilt trend too. 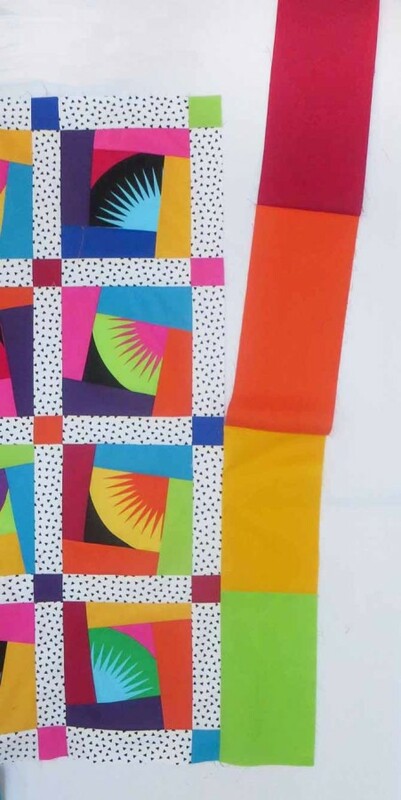 This border style is a great way to use up the leftovers after the rest of the quilt is finished!